The new 2018 Maruti Suzuki Ertiga has been launched as an all-new car which gets better styling, is bigger than before and also, a new petrol engine that comes with automatic transmission. We find out more about it in our review. Maruti Suzuki has been on a roll as they are coming out with impressive products one after the other. And the latest one to come out of their garage is the all-new Ertiga. Yes, it doesn’t look anything like the Swift and I believe that is the best thing about it. And of course, the reason for that change in its styling is that there has been a lot of effort that’s gone into the aesthetics department and that shows. The new Ertiga is now a bolder, and also, bigger. Let’s start with what’s making it bolder. 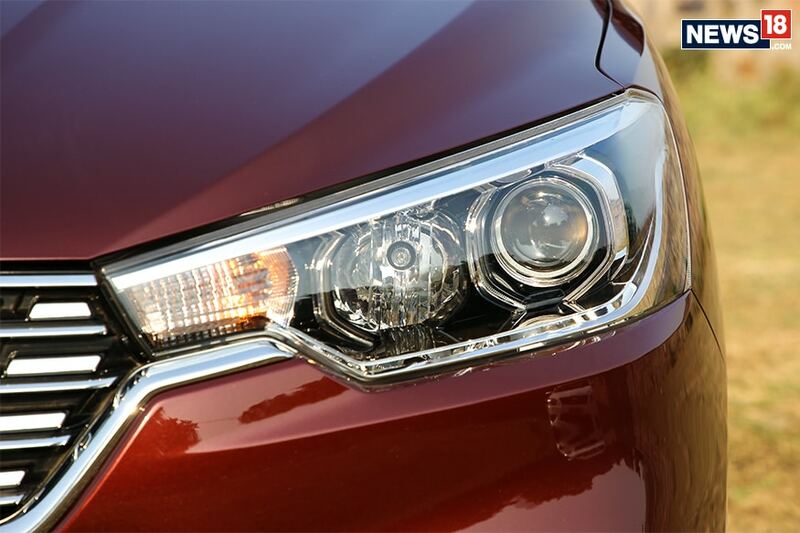 At the front, it now comes with a new chrome-studded grille which is complemented by those sharp projector headlamps which are going to be standard across all variants. Then, there’s the new chiselled front bumper that neatly flanks the fog lamp housing and is an interesting design element. From the sides, the highlight is the floating roof design that makes the car look premium and the sharper shoulder line gives it a muscular look. 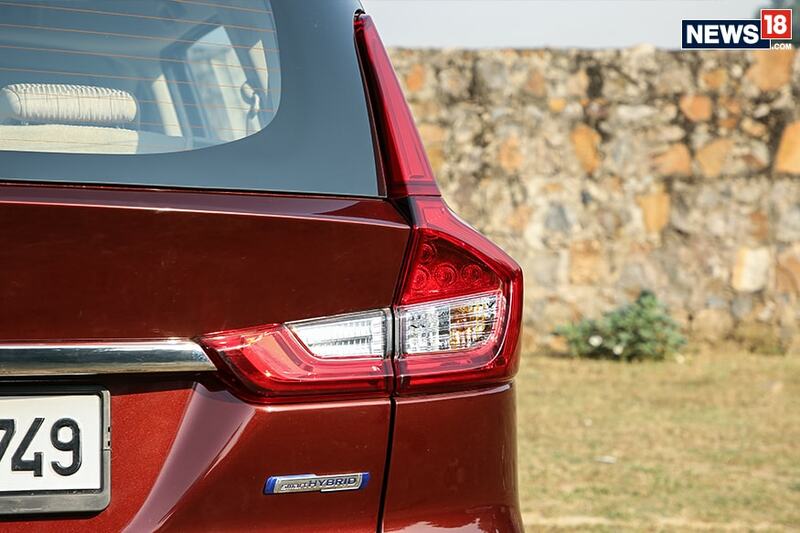 At the back, the new Ertiga gets LED tail lights which look good and also look a bit Volvo. But still, as a whole, the car’s road presence has gone up by leaps and bounds and feels refreshing. The story continues on the inside as well. 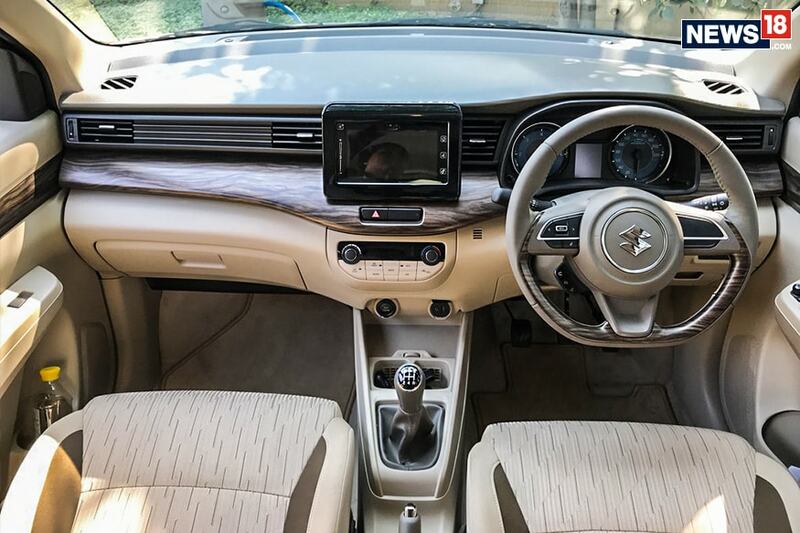 As when you hop inside the cabin you are greeted by an all-new dashboard layout which is specific to the all-new Maruti Suzuki Ertiga. Which means you won’t see this design in any other Maruti Suzuki car and that gives it its own identity. The highlight of the cabin is the maple wood finish which also carries on to the flat bottom steering wheel and the doors as well. If you happen to choose the top variant of the car then you will also get a 7-inch touchscreen infotainment system which is frankly, one of the best infotainment systems in the segment. The touch response is fantastic and it also supports Bluetooth, Apple CarPlay, Android Auto and Mirror Link technology. Also, a key feature to take note of is the air-cooled cup holders which are a nice touch. As for the ergonomics, the driving position is exactly how you would want it to be with great visibility ahead of you. And the good bits continue at the back as well. So the middle row continues to be the strong point of the all-new Ertiga and let me explain why. I set the driver seat adjusted to my driving position and I’m 5 foot 10 inches in height. Then, in the middle row, I still had a huge amount of leg room, shoulder room and headroom on offer and next to me is the huge glass panel which makes everything feel a lot airier. And all of this comes together to give you a sense of feeling that the cabin is a lot bigger than what it actually is. But the biggest change can be seen in the third row of seats. Simply put, they are more spacious than before and can now actually fit adults who won’t be squeezing themselves that much, making it usable for regular commutes. This is unless you are over 6 foot in height that is. What the last row passengers would also appreciate is that now the seats can recline, allowing them to create more space for themselves. And that is largely due to the increase in the car’s dimensions. It is now taller, wider and longer than before. And since it is based on Suzuki’s latest Heartect platform, it allows them to make more space inside the car, almost everywhere. And that increase in space translates into an increase is space at the boot. With the third row up, you get 209 litres of boot space which is quite decent for a car of this size. The last row and the middle row of seats can be folded to make up to 803 litres of space. That’s not it, the floor of the boot can be removed to create more space as well and gives the boot a bit of a modular feel. 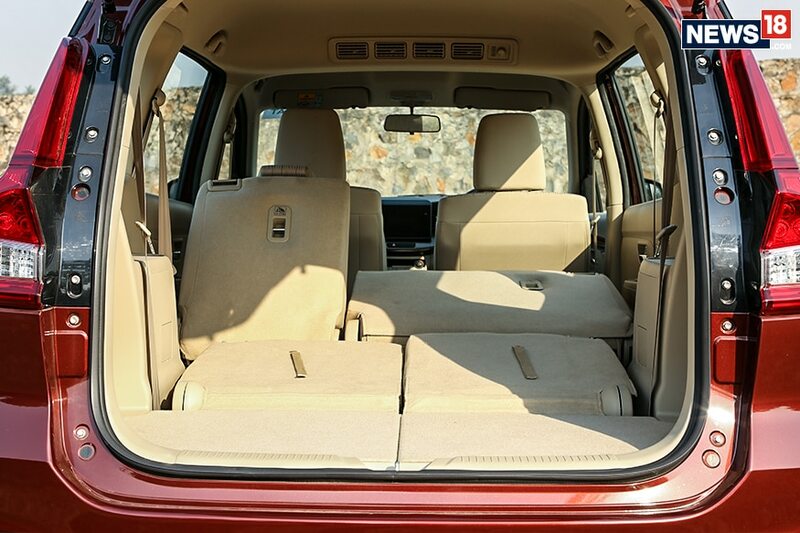 All of this combined, the amount of space that the Ertiga offers makes it ideal for your weekend getaways. As for the engines, the new Ertiga retrains the tried and tested 1.3-litre DDiS diesel engine that comes with a 5-speed manual transmission. While the diesel drivetrain remains the same, the petrol engine is the new 1.5-litre K15 unit which was seen first on the recently facelifted Maruti Suzuki Ciaz. And this engine also brings along itself the optional 4-speed automatic transmission, making it a completely new drivetrain for the Ertiga and hence, this was the variant we chose to drive. Interestingly, the Ertiga now comes with Maruti Suzuki’s Smart Hybrid technology which helps in better fuel efficiency as it provides torque assist at lower RPMs and also an idle start-stop feature which kills the engine at idle to save fuel. 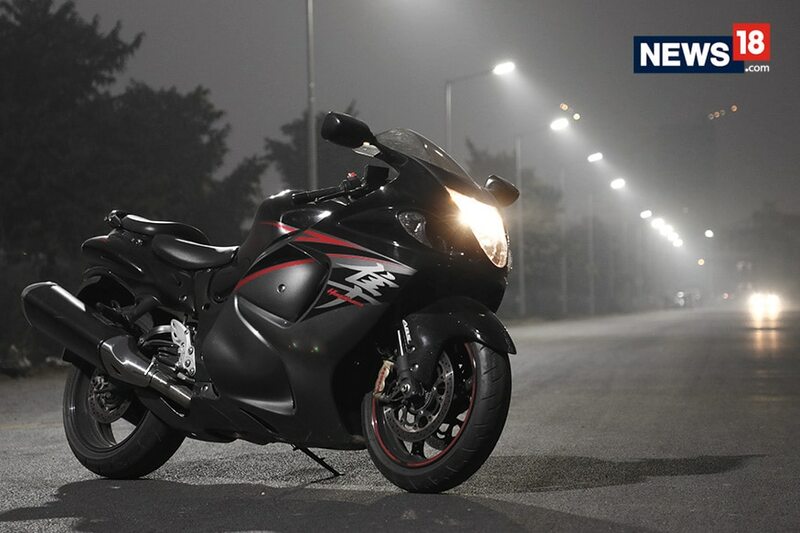 When it comes to driving, the engine feels peppy and refined and can do highway speeds with ease all day long. We were concerned if the 4-speed gearbox would be enough and to our pleasant surprise, it is. The gearshifts are smooth and you barely notice the kick down. The engine and the gearbox work in harmony to give a good drive-quality. If we had to nitpick, the engine sound does creep into the cabin and gets noticeable at higher RPMs. As for the suspension, it is a bit on the stiffer side but that should feel just fine when you have multiple passengers on board. And let’s not forget, safety features like ABS, EBD, dual airbags and rear parking sensors are being offered as standard across all variants of the new Ertiga. And to wrap things up, if you combine everything together, it’s hard to fault the car when you consider what it is meant to do. The Maruti Suzuki Ertiga was always a good value for money car. But over the years it started to show its age. Then the new Swift came along, then the new Dzire came along, but this time around the Ertiga stands as a separate model by its own and a pretty good looking one at that. Now, the only competition that it really faces is the Mahindra Marazzo, which might be more spacious, but is also quite a bit more expensive. So, if you’re looking for a good family car, then this one makes a lot of sense.